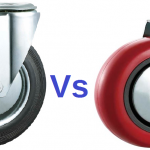 Castors and Wheels generally take the brunt of wear and tear to a piece of equipment. Damage, Wear or Deterioration of Castors and Wheels can drastically affect the handling or efficiency of an otherwise perfectly good condition piece of equipment. Regular maintenance and ultimately replacement castor wheels should be considered. Consider you purchase a brand new Industrial Trolley for your warehouse, complete with a set of shiny new castor wheels. The Trolley operates smoothly with low roll resistance providing your warehouse staff with a useful “tool” that increases warehouse efficiency and reduces operator fatigue. Fast forward one or two years and those shiny new castors will not be in the same condition, even with regular maintenance. Increased Roll Resistance and difficulty in manoeuvre may be experienced, increasing operator fatigue and reducing warehouse efficiency. Whilst maintenance of the Castor Wheel will increase the life of Castors and Wheels, ultimately the Castor or their wheels will deteriorate or wear over time and replacement castor wheels will be required. After all, the trolley itself is most likely still in good condition and the cost to change the wheels is comparatively low cost. Unfortunately it is common in the workplace to see many types of equipment that have worn out or damaged Castor Wheels and should be replaced, which in the long run would pay dividend to efficiency. Damaged or Worn Wheel Treads are one of the most common failure modes of a Castor Wheel, yet many people continue to “make do” with them. Luckily this is one of the easiest failures to rectify. Most Castors are designed so that the wheels can be removed from the Forks (brackets) and only the wheel is replaced. Not only is the economical, as only the wheel needs to be replaced, but also the whole castor assembly does not need to be removed, resulting in quick and easy replacement. 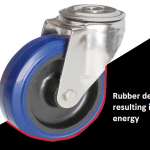 Rubber based castors, whilst having many benefits, are most prone to wear and damage. It is likely that with rubber castors the wheel is the first point of failure, meaning the bracket is most likely in good condition. For hard wearing Castor Wheels, such as Nylon Castors, you may find that by the time the wheel has worn or become damaged, that the bracket may also need replacing. Material damage due to the environment? Rubber Wheels are excellent for providing low noise and manoeuvring on uneven floor, however they are not the most suitable material if the equipment will be standing still for long periods of time, particularly if exposed to the outdoor elements, such as UV. Flat Spots or Cracking can occur in the rubber considerably increasing the roll resistance. On the other hand, Phenolic Castors are excellent at accommodating extremes of temperature and thermal shock, but add water or fluids into the mix and they can deteriorate rapidly. Load Noise and Rattling during manoeuvring? – This could be a sign of worn out wheels, particularly around the axle, as the wheel start to become loose. Once the Axle hole is worn on a plain bearing wheel, it’s time to change! Wheel Bearings & Swivel Bearings can wear and/or loosen over time, which can potentially allow some of the ball bearings to escape. Generally most Castor wheels are considered “maintenance free”, it won’t harm to put a little grease on the bearings every now and again, particularly if the equipment is used on a daily basis. Once the ball bearings are worn, or missing they cannot easily be replaced and the Castor will need replacing. Impact Damage – Of course impact can affect any part of the Castor, whether it be the Wheel, Brackets, Fixing Plate or Bearings. If its damaged it should be replaced. Remember if the wheel is damaged it can normally be replaced without changing the whole castor assembly. Our engineers at Bulldog Castors Ltd have decades of experience with the material handling industry. They can assess damage, offer replacement castor wheels and components and propose improve options for replacement Castors and Wheels. The technical department can be contacted on sales@bulldogcastors.co.uk or by calling +44 (0)116 2970521.